Some DSL Internet Service Providers (ISPs) use modems with router capabilities. In many cases, the modem-router has the same IP Address with the Linksys router. This results in a conflict between the router and the modem. To resolve this, the local IP Address of the router will have to be changed. This article will guide you in changing the local IP Address of the router. NOTE: This article assumes that you have access to the Internet through the modem. 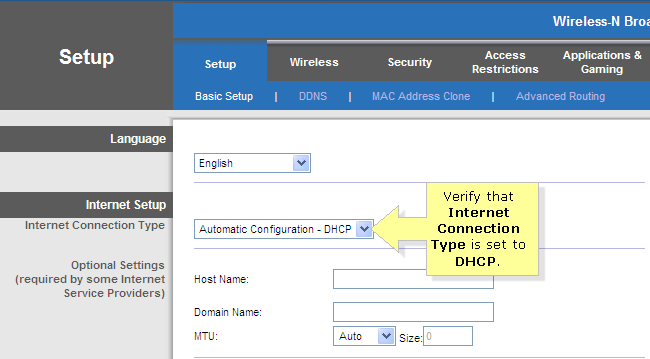 On the router’s web-based setup page, verify that Internet Connection Type is set to DHCP. Change the value of the third box of the IP Address. NOTE: In this example, the IP Address used is 192.168.2.1. Click Save Settings to apply changes. After changing the LAN IP Address, enter the new IP Address in the Address bar to access the router's web-based setup page. If you are unable to access the web-based setup page after the IP Address change, you may need to reset your router. For instructions, click here.